Recently, Anker’s sub-brand Eufy released a new wire-free outdoor security camera solution which hopes to gain some traction in an increasingly competitive market. Price at £319.99 but currently available with £20 off, the eufyCam E Security Camera claims to be able to achieve 365 days between charges and 3 years in Standby Mode. Off the top of my head, no other competing solution offers this which makes the eufyCam E a compelling choice from the get-go. In comparison, the Reolink Argus 2 only offers 180 days between charges, though in their case, you can boost that via the optional solar panel. Similar to several other recent security cameras, including Reolink, and Yale, Eufy is bucking the trend of subscription-based cloud recording by allowing you to record your data locally via a microSD card. This will then later be complemented by an optional cloud recording service. For the most common usage scenario of up to 10 events a day at 30s per video, the 16GB microSD card can store up to 1-year’s worth of video clips for a single camera. Therefore, if your eufy Security system has 2 cameras, a 16GB card could store 6 months of videos. The camera records in 1080p using a Sony Exmor sensor, combined with a large f2.2 aperture which they claim to provide crisp and clear low-light footage in the evening. The base unit can support up to 16 camera and 16 entry sensors allowing you to have thorough surveillance across your home. Anker is normally one of the best companies for affordable products. Though I think this system may be priced a little too close to the big named brands to persuade some people to commit to the investment. For example, you can pick up the most basic Arlo for £214.00 for the two pack, this option requires you to have cloud recording though, and it uses weird batteries that you need to buy. Arlo pro is probably a little closer in competition priced at £349.00 for the two pack which includes proper rechargeable batteries and has the option for local recording. So, in comparison, the eufyCam E is about £50 cheaper currently and offers superior battery life, plus they include proper outdoor mounts for the camera. So I would say it is worth the cost, the problem is whether or not the average Jo will appreciate these differences over the market-leading Arlo. Setting the system up is quite simple, with many of these new home surveillance products pairing the camera can be tricky. I am currently reviewing a model from D-Link, and it was a nightmare to get to work. Similarly, the Kodak Cherish 685 was tricky to get working too. Furthermore, some of these newer models have questionable app design, with the Kodak being another offender. I think this is why Arlo have done so well, their app is easy to use, nicely designed and when I have used their products before it was also quick and straightforward to set up. I also had a similar experience with Ring. Eufy Security, the app used to control the system is equally easy to use and well designed. While it was easy to do, some patience was required when setting things up, when adding the base unit, and then the cameras the system appeared to stall with nothing happening. When I exited out fo the app the devices had successfully been added. I think as you add each device it runs an update and this can give the appearance the app isn’t doing anything. Even with the small issue, the base unit and each camera were added to the system first try, which is more than can be said for others. Eafy kindly includes two different mounts with their cameras, whereas the similarly designed Arlo outdoor mount will set you back £12.99 each. Then there is the magnetic mount which can be used in less exposed positions. I was hoping to use the magnetic mount as a table/flat surface mount, but the way it is designed doesn’t work, and you need to screw it into a wall. It looks like Arlo has a similar design. You can, however, place the camera down flat on a surface as the base is also flat. To avoid drilling more holes into my outdoor brick walls I set the system up in my garage, with one camera mounted to the woodwork outside and another inside sat on the window sill. There are quite a lot of thefts from garages around my area, and we have had one bike stolen, so this is a good placement for me. Once you have everything set up the way you want, you can tweak the camera settings inside the app. You can have multiple recording modes, each affecting the battery, the default option is 20 seconds recording and a lowered detection period. If you are happy to charge your batteries more often, there is optimal surveillance which records for 60 seconds. Then there is the custom mode which you can set the clip length and retrigger length manually, going all the ay up to 120s recording with 0s to 60s retrigger intervals. With motion detection, you only have the option to set the sensitivity, and there is no zoned monitoring. From what I can tell from all my reviews this appears to be battery related, as I can’t think of any wire-free option that has zoned motion detection. I assume it is processor intensive, therefore battery intensive. Each camera has a microphone and speaker built in, so you can have push to talk or set off a siren. One thing in the settings I have not seen on competing models is the NAS RTSP option which allows you to configure recordings to your NAS via RTSP. Synology supports this, and other support will be dependant on your NAS. With it using the RTSP protocol it should (and does) work with popular software such as Blue Iris. I have several POE IP CCTV cameras so use Blue Iris to manage them all. I have only done some limited testing of this, when I first set up the RTSP in Eufy I can view a live stream of the camera, but it does cut out, then I have to disable and re-enable it. Clearly, you should not be running a live stream permanently on a battery-powered camera, so this is not the intended use of it. The option is classed a beta, and I would treat it as such. It is, however, a very interesting feature that I am not aware of anyone else offering. So far, I have found the performance to be excellent, with the motion detection being almost suspiciously good about not generating false positives. The concern is that I may not actually catch all the events. For example, where the camera is pointed there is a washing line with clothes pegs on it, most of the cameras I use will start sending recordings as soon as a slight breeze happens. However as far as I can tell it has worked well, in the evening, it has been sensitive enough to capture a cat walking across the garden, and if it triggers based on that, I am confident it will trigger whenever an intruder enters the garden. Video quality is good both in the daytime and the evening. It is perhaps not quite as smooth compared to a wired camera, but it is more than adequate enough for security. Night time quality could always be better with pretty much all cameras, the IR on this takes a little while to illuminate so if it was someone running past it may not catch them. I general though it is good enough for what it is intended to do. Connecting to the hub also works well. With some other systems they can be a bit buggy, occasionally Reolink might take a couple of attempts before it connects to a feed. Once you load up a video, it is simple to download footage and share it if needed. One issue that came up when researching this product some more is that it is not the same as the original version that was listed on Kickstarter, and it is a lower spec. The Kickstarter model has AI and Google functionality. I have not used the Kickstarter model, so I can’t say how much better it would be, in particular, it would be interesting to see how much of a difference the AI makes. However, I am happy enough with the performance as it is not to be too upset at the lack of AI. 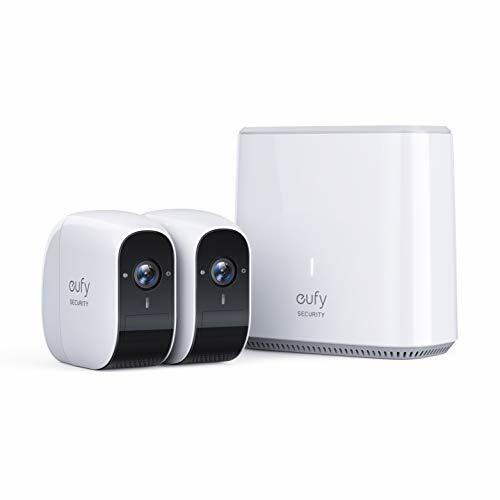 Overall, I have come away very impressed with the eufyCam E, at first, I thought it was priced a little high, being a bit too close to the Arlo Pro for most people to consider it. However, with the £20 off it is £50 cheaper or around 15% less than Arlo Pro. You also get proper outdoor mounts which is worth another tenner or so. Whether the average consumer feels the same is another question. The RTSP functionality is something that I find particularly interesting which differentiates this from the rest of the pack. Most importantly of all, I have found the overall performance to be good for a wire-free camera. False positives are rare, and I have not been aware of any situations where it has not detected something. Both daytime and nighttime video quality is good too, certainly as good as or better than many of the recent cameras I have used. So overall I think this is one of the best systems I have used. I would say it is certainly worth considering over the Arlo Pro. I think it also outperforms cheaper options such as the stand-alone cameras from Reolink. NextDDR4 Prices have crashed. What are the best deals right now?